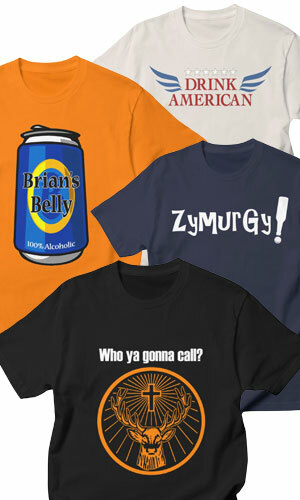 Hey you mugs, thinkin’ ain’t drinkin’. I’m always looking to supplement our deep fried Thanksgiving turkey with the proper Cajun accoutrement… whether it’s an appetizer or side dish. 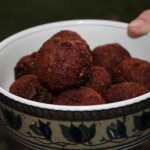 I’ve been toying around with a recipe for Fried Cajun Stuffing Balls and I decided to finally get it down in digital form to share for this T-Day. 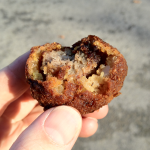 People have been eating stuffing since the Pilgrims landed at Plymouth Rock, so I would think I didn’t invent Fried Stuffing Balls… but I’d neither heard of them nor consumed them before I decided to make them. I’m calling this version 1 with the option to improve it (updated to 1.2 with refinements and images). Stuffing should be prepared according to the box/bag with the exception that you may want to finely chop the celery and onions, and use about half of what the preparations call for (except for the fluids). I find that the stuffing will roll into a ball better when it is a little moister and less chunky with wedges of celery. Additionally, add the Cajun seasoning to the mix–anywhere from a sprinkle to a teaspoon may do, but this is to preference. I have used a 16oz. loaf of Jimmy Dean mild or hot sausage, but you may have your own southern style of sausage in mind, perhaps from your local butcher. 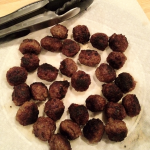 Roll the sausage meat into balls, about the size of a quarter… think mini Swedish meatballs. 16oz. will get you 32 perfect sized balls. Heat the oil in a fry pan and fully cook the sausage until it is browned–you want it edible but not overcooked (the final step only re-heats the meat). Drain your balls (couldn’t resist that one!) and pack them into the delicious center of a stuffing ball that you form in your hands. This ball should be larger than the size of a golf ball… think hush puppies. 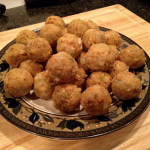 Your goal is 32 cajun balls, so spread out the stuffing accordingly. The ball that you’ll be deep frying will cook on the outside and heat itself in the center. If you’re planning on deep frying a turkey, you’ve probably already got your oil pot up to about 350F. 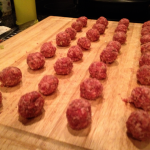 Assuming the balls are room temp or refrigerated, fry them about 5-8 minutes. CHECK ONE BEFORE YOU PULL THEM ALL OUT! It should be crispy on the outside and hot in the middle. Brown is good, black is bad. The nice part is that you can prep these early and get them into the deep fryer when you are ready to eat… have them as an appetizer or with the main course. 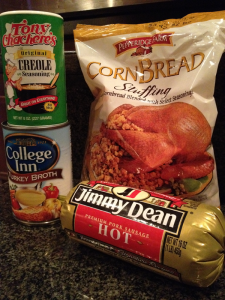 I don’t want to leave any traditional turkey lovers out… if you wish to try these and don’t have a big pot of bubbling oil available, you should bake them based on the stuffing recipe or give pan frying a try. I dont like sausage, is there anything else that works well w/stuffing? I’ve considered trying this with mini hot dogs for a Thanksgiving-style Pig-in-a-Blanket… think of it like a corn dog, especially if you use corn bread stuffing. I made these for my family at Thanksgiving, and they were a HIT! 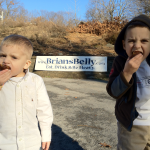 We baked them instead of frying and they turned out great. The family has already requested them for next year! I made them last year and it was awesome. A few got overdone because it took a bit of doing to fish them out. This year I have the right gear so I will try to achieve perfection this time. I was wondering if you have ever baked the sausage instead of frying?